Meal prep made easy! 3 steps to meal planning, 6 ideas to meal prep + Instant Pot (or InstaPot) Chicken Jambalaya recipe. A great make ahead recipe because flavors develop over time and it may stretch to 2 or 3 meals! That means it’s time to kick back and relax. Right? Somewhere. But not your house after work when the kids want attention, the dog demands even more, and you’re trying to get dinner on the table. Meal planning helps control the chaos, saves time and money, decreases the number of trips to the store and reduces wasted food. I know, you’re thinking I don’t have time to plan! But, seriously, it’s not that bad, The more you flex this planning muscle, the easier it gets. 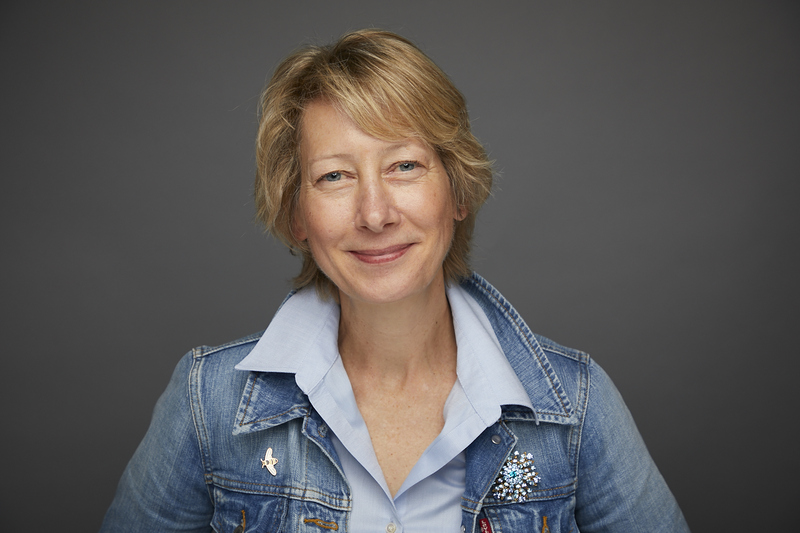 Here are three steps to get you going. Before you grocery shop, survey your cupboards, fridge and freezer to see what’s available. Are there foods on hand you can use to start a recipe? Tomatoes (canned or fresh) can be simmered with olive oil and garlic to make a pasta sauce. If you have a can of olives, tuna or clams, add those. Do you have fruit or vegetables you can repurpose into a salad or salsa? Use this weekly meal planner to get started. Plan at least 3 meals you can make this week. 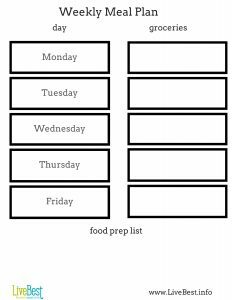 Jot them down on a weekly meal planner (made one for you ;-), or you can buy one What to Eat notepad (did not make that), your phone or just a piece of paper. Check the grocery ads to see what’s on sale and what’s in season. Seasonal fresh fruit and vegetables taste best and cost less. If you’re unsure, ask the store produce manager to learn what’s in season. Plain frozen and canned fruits and vegetables are also good options. Keep high-fiber foods in mind. Fiber is found in plant foods such as beans, seeds, nuts, whole grains, fruits and vegetables. Think about how you can use what you’re cooking in another meal. Cooking ground beef? Cook extra and freeze for next week. Baking chicken? Save half to make into salad with lettuce, avocado, cucumber and orange slices. Cooking quinoa? Make extra to add to soups, chile, or tossed with black beans, corn, green chiles and a vinaigrette. Set aside a meal prep power hour to focus in the kitchen on foods to use through the week. Sunday works for me, but find the time best suited for your schedule. Sometimes I turn on some music. Sometimes I enjoy the quiet. Whatever your vibe, you’ll save time and your sanity during the week. Set the oven to 350° F. to toast nuts, bake oatmeal, roast vegetables, bake potatoes or chicken. Potatoes can be reheated and topped with broccoli and cheese or chili. Try these Sweet Potato Nachos. Add chicken to salads or casseroles, or layered on a sandwich. While the oven is heating, chop vegetables for side dishes, snacks and lunches. Keep some raw and store them at eye level, in a clear container in the fridge. When they’re the first things you see, you’re more likely to eat them. Toss some with 1- 2 teaspoons of olive oil, spread on a baking sheet and bake until just tender. Use on pizza or in a frittata. Simmer a pot of soup or jambalaya. Split pea soup, Peruvian Quinoa soup, beef and barley or white bean chicken chili can give you a night or two of meals. Hard cook eggs. Perfect for breakfast, lunches, and snacks. Add in salads, such as canned beets, toasted walnuts and feta cheese crumbles or make Curry Egg Salad. Cook a whole grain. 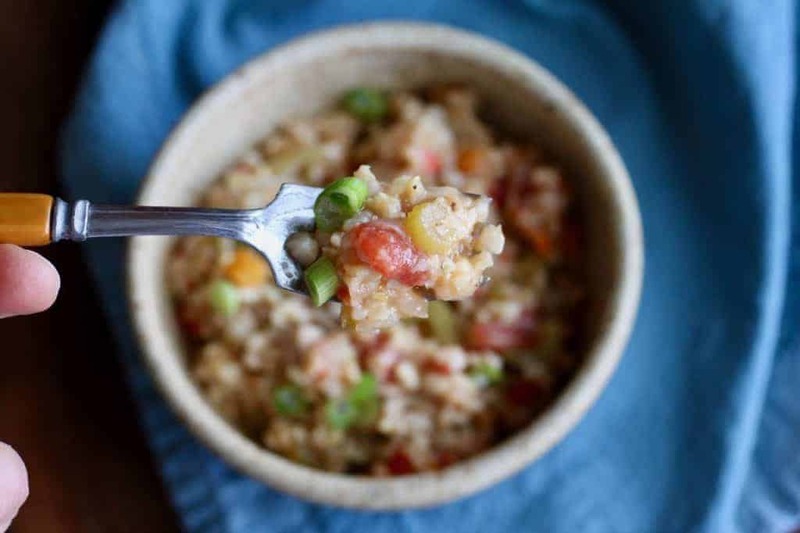 After the eggs are cooked, rinse the pan to make quinoa, bulgur, or wheat berries. This is an easy way to boost fiber and protein in salads. Or top with yogurt and fruit for a quick breakfast. Blend bean dip, artichoke jalapeño dip, or hummus for a high-fiber snack that’s ready when hunger strikes. Pack it with veggies and whole-grain crackers for lunch. Knowing that I have healthy food waiting for me gives me peace of mind. When I’m traveling, I make a batch of pasta sauce or soup freeze before I leave so I can walk in the door and have an satisfying meal. Jambalaya is a great meal prep recipe. Flavors develop over time and it may stretch to 2 or 3 meals. This is a healthier recipe than most. I boosted the healthy quotient with more vegetables and used brown rice rather than white rice. 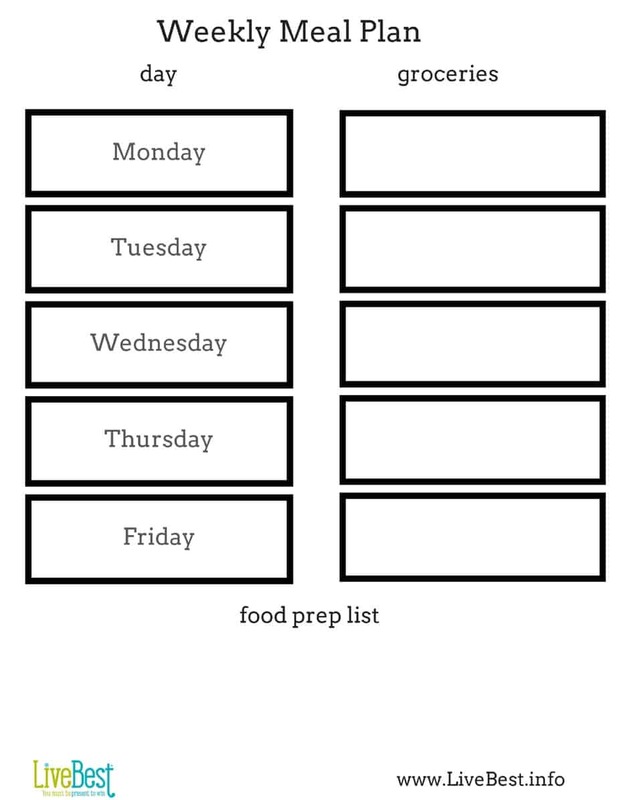 Weekly meal plan I made this for 5 days because most of us aren’t cooking 7 days a week. Are we? 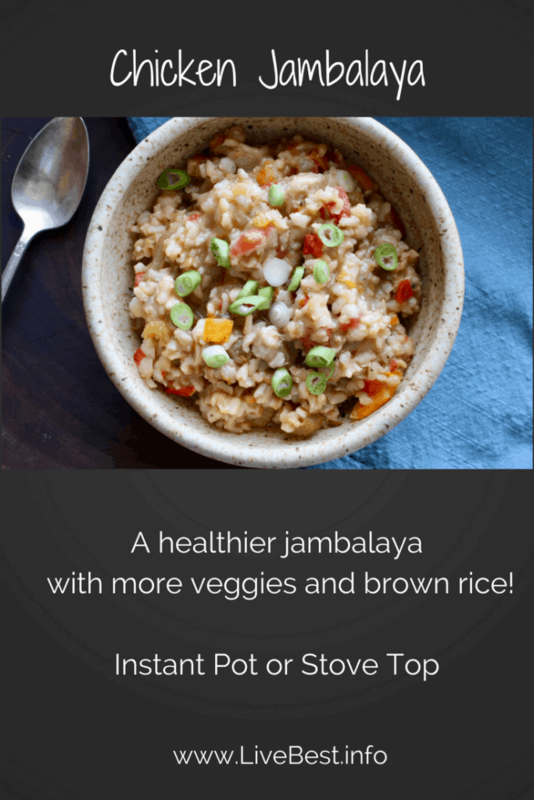 Instant Pot I made jambalaya in my Instant Pot and included the recipe below. It’s a useful, time saving appliance. P.S. 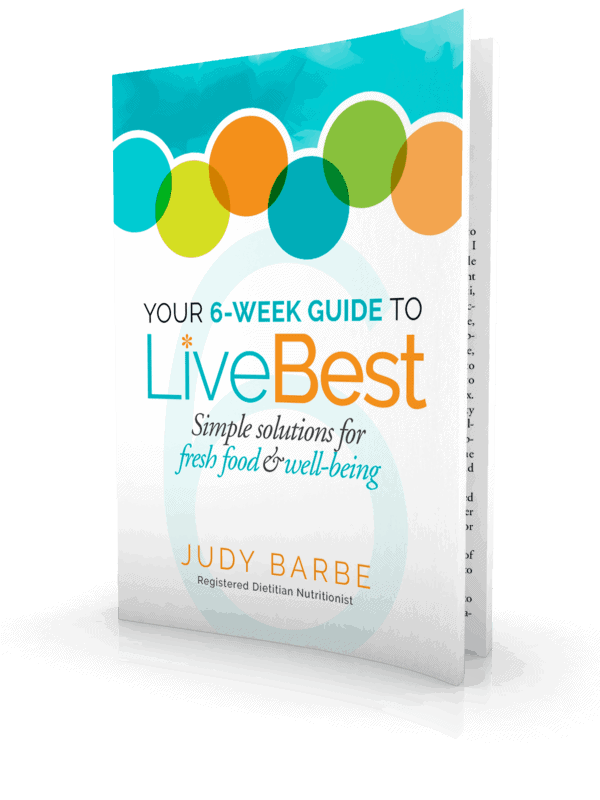 Want more healthier eating tips and recipes? Sign up for my newsletter here. 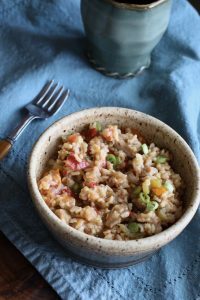 Jambalaya is a recipe that may stretch to 2 or more meals. 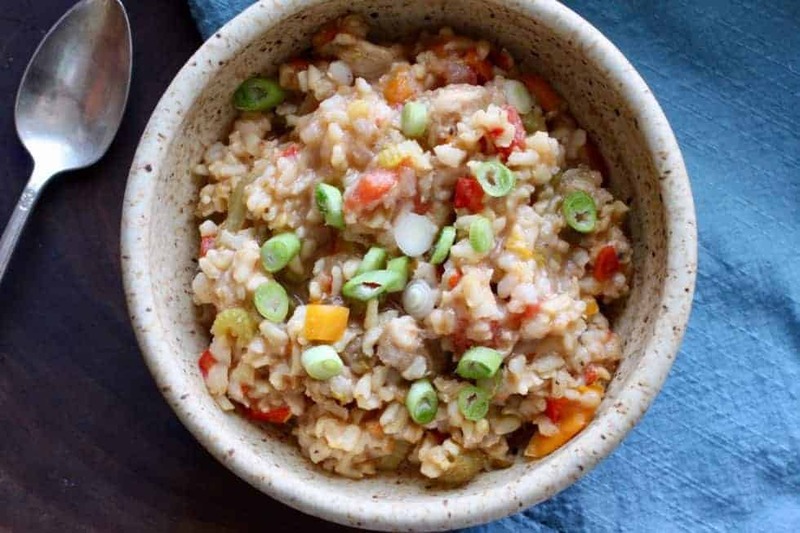 I boosted the health quotient with more vegetables and used brown rice rather than white rice. Cook on the stove or in an Instant Pot. Cook: In a large pot heat over medium heat, pour in oil. Add celery, onions, and peppers, cook and stir until softened, 7-8 minutes. Stir in garlic and rice, cook 1 minute, stirring. Add tomatoes, broth and water, bay leaves, Creole Seasoning, cayenne, Worcestershire, oregano, salt, pepper, thyme and chicken. Bring to a boil, reduce heat to simmer, cover with lid, cook without stirring for 20 minutes, until rice is cooked but not mushy. Stir before serving. Sprinkle with chopped green onions. Cook: Pour oil in Instant Pot liner. Press Saute. Add celery, onions, and peppers, cook and stir until softened, 5-6 minutes. If vegetables appear to be cooking too quickly, press Cancel to allow Instant Pot to cool down a bit. Press Saute when ready to heat again. Stir in garlic and rice, cook 1 minute, stirring. Add tomatoes, broth and water, bay leaves, Creole Seasoning, cayenne, Worcestershire, oregano, salt, pepper, thyme and chicken. Press Cancel. Seal: lid on Instant Pot. Make sure Vent handle is turned to Seal. Push Manual, High and set timer for 10 minutes. Let Instant Pot cool for 5 minutes, turn handle to release steam. Stir before serving. Sprinkle with chopped green onions.